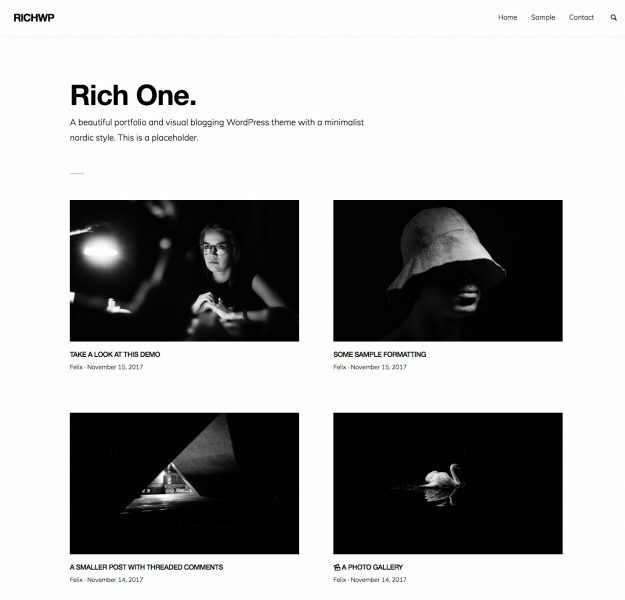 RichOne is a beautiful portfolio and visual blogging WordPress theme in a minimalist nordic style. It is fully responsive and looks sharp and polished on all modern devices. The code base is as lean, fast performing and rock solid as the theme’s timeless design. This theme can power your WordPress site for years to come. It is easy to install and work with on a daily basis. It is a truly hassle free and visually stunning solution to get your site online in a streamlined, futureproof and professional way. This theme is WooCommerce compatible as well as Jetpack and Gutenberg ready. Check out the demo. What you see is what you get! No fluff, no compromise, just raw performance in a clean design. Installing the RichOne Theme is as easy as it gets. Check the Installation & Setup Guide no need to break into a sweat. Get your site elevated with the RichOne Theme today. Your success will be accelerated. It′s your turn to make headway!